My neighbor and I took a walk on the boardwalk along the beach near our homes. We live on the north shore of long Island where the Long Island Sound faces the shores of Connecticut. We often take walks together where we rest half way by sitting on the benches that line the boardwalk. As we were sitting there we watched the bright blue sky fill with the long feathered fake clouds that had been sprayed above our heads all day long. My neighbor pointed out the different chemtrails and noted that she had been noticing new zipper style trails now joining the typical long chemtrails we usually see. I am fortunate to have a bright alert neighbor who realized long ago that chemtrails are not contrails and that we have been undergoing mass spraying now for years. Often she will call me and tell me to step outside to view the sky when the spraying is extremely heavy or unusual. I watched as she pointed to the jet that was at a higher altitude than the other jets and watched as it sprayed out a long stream of what looks like a zipper or long knotted rope . The trail on this type of chemtrail also bellows out to form long full clouds that last all day and spread out across the sky. This new style of trail not only is sprayed out differently in this zipper pattern it feathers out in a different design once it opens up to a full cloud. A few months ago the overhead spraying in my area seemed to have slowed nearly to a stop. Our skies were looking clear and far more normal then they had in many years. I was hopeful whatever the reason was for the chemtrail activity for the past years had been completed or stopped. My hopes quickly faded as the jets returned and the spraying resumed once again filling the sky with the crisscrossing x lines of fake clouds filled with strange chemicals. The added sight of the zipper trails makes it all more confusing and concerning. "I took photographs of contrail left by what seems to be a Pulse Wave Detonation Engine. The aircraft emitting the contrail was almost to the western horizon by the time I noticed the contrail almost overhead. I only saw a glint of the aircraft in the very bright sunlight,(my angle of view was almost directly into the sun). It appeared to be traveling at a very high rate of speed. It traveled in a straight line from the southeastern horizon to the western horizon. I heard no sound at the time of the sighting, nor after. This could be consistent with other reports of top-secret experimental,(or operational? )military aircraft such as the "Aurora", or the "X-33". A pulse detonation engine, or "PDE", is a type of propulsion system that uses detonation waves to combust the fuel and oxidizer mixture. The engine is pulsed because the mixture must be renewed in the combustion chamber between each detonation wave initiated by an ignition source. Theoretically, a PDE can operate from subsonic up to a hypersonic flight speed of roughly Mach 5. An ideal PDE design can have a thermodynamic efficiency higher than other designs like turbojets and turbofans because a detonation wave rapidly compresses the mixture and adds heat at constant volume. Consequently, moving parts like compressor spools are not necessarily required in the engine, which could significantly reduce overall weight and cost. PDEs have been considered for propulsion for over 70 years. Key issues for further development include fast and efficient mixing of the fuel and oxidizer, the prevention of autoignition, and integration with an inlet and nozzle. To date, no practical PDE has been put into production, but several testbed engines have been built and one was successfully integrated into a low-speed demonstration aircraft that flew in sustained PDE powered flight in 2008. In June 2008, the Defense Advanced Research Projects Agency (DARPA) unveiled Blackswift which was intended to use this technology to reach speeds of up to Mach 6. However the project was cancelled soon afterward, in October 2008. It also states in Wikipedia that as far as it is known these engines are not in full use at this time. Upon further reading of searches on this subject it became clear to me that others have noticed this zipper or knot type trail showing up along with the usual chemtrail spraying. My main goal is to one day know exactly what is going on with all of this spraying that is being reported, shown in videos and photos all over the world. Years ago there were many theories floating around about what the purpose of the massive spraying was for. I think it has been going on for such a long time at this point that believing it is to hurt the population or other sinister reasons seems more and more unlikely. If that were the case we have been heavily sprayed now for so many years I think we would be dropping like flies at this point if that were the case. Personally I tend to believe that the massive world spraying is more likely a defense situation that is trying to defend the planet against the harsh cycles of our sun or a attempt to stabilize a destabilizing atmosphere. I think a protective reflective action is the desired outcome of the chemtrail activity. It is obvious the human race is on a need to know only base with this activity. It does not matter however as most of those walking on the planet do not care or seem too concerned about the wild sky above them . 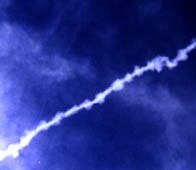 Those who are at the root of the chemtrail activity are not called to answer for it and are able to continue as they desire or need with the action with little or no call for answers from the public. I would think that although we are told the pulse detonation engines are not being used - apparently they are which is what is producing the new zipper trails now mixed in to a long day of chem spraying. It may be a easier quicker application that can be administered from a higher altitude or some such thing that has it now added to our routine chemtrail spraying. I long ago gave up trying to reason with the public that this issue is something we all need to be aware of. It is clear to me that my fellow human beings do not care nor are they interested in any shape of form to what has taken over our skies and changed the skyscape of our planet. I do feel an obligation to my own concern to continue to try to present it to the attention to anyone who may understand that this is not a insignificant issue. I also fully understand by my own research that the spraying is not by way of normal commercial or military air traffic. The chemtrail spraying does not appear in the air traffic lanes instead takes place in wild patterns across the entire sky. The other false excuse is that they are from varied climate conditions which causes them by way of normal traffic. That is an extreme lie as we have taken care to watch the weather and conditions noting that the chemtrails have no relation to this thinking. You can find identical conditions where one day the sky is blue and clear and another with the sky filled to bursting with the lines and fake clouds delivered by the chemtrails and now added zipper trails. This excuse does not hold any attention at all as you can easily witness the chemtrails being sprayed while the military and commercial traffic is moving in their normal lanes without any sign of any exhaust or trail. I believe chemtrails are the result of major changes to our sun, or our planet, our climate or the need to defend against something we do not understand. I think the issue has been ignored by the beings living on the planet in almost as trance like strangeness. I use to write in a joking manner that I thought they were spraying us with dummy juice as we seemed so disinterested in something I feel is extremely serious. I do not know what is going on however I do not think at this point we can and perhaps we should not try to stop it. I say this as the dedication to this huge worldwide spraying has been a well planned organized international event . Knowing this I can only assume and hope it is being done for the good of the world . I do know there are far easier methods of harming the planets population . It appear to be more logical that all of this careful long term activity and effort is geared to keeping us all alive. I remain confused and concerned on this issue and hope one day very soon we will all understand the who and why of this ongoing mystery. Although there are no formal answers offered to why we are being sprayed I am sure the reasons are as huge as the chemtrail programs seen all over the world. I do not exclude any theory that is sound and logical concerning this issue. I have no idea who is doing this however I do know it is a world wide mission with a massive organized base. The problem is we do not know who or what is controlling or driving this huge planet wide spraying. I consider this one of our greatest mysteries that mankind has without question allowed to develop under our human radar without explanation or concern. That alone is as strange as the fake lines and phoney clouds that fill our skies.